Spitalfields in East London sounds like a place out of a Dickens novel; images come to mind of the Artful Dodger racing over the cobblestones and seedy characters lurking in dark and foggy alleyways, spitting as they size each other up. 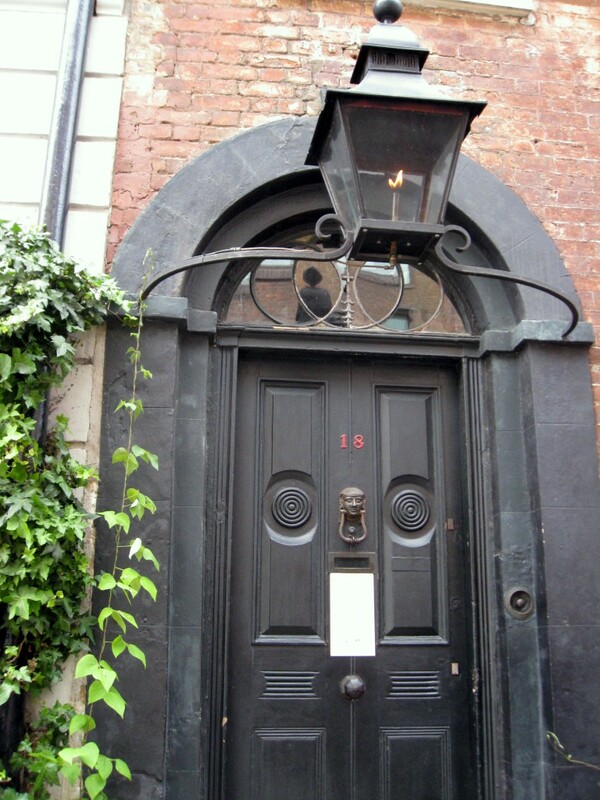 However, any macabre desire to encounter ghosts from Victorian times was abated by the bright sunny day in July this year when I approached 18 Folgate Street: Dennis Severs’ House. I knew in advance that this historic house was rich in decorative arts from the eighteenth and nineteenth centuries, some in a sorry state; but it’s the sensory experiences of a living house-museum that I’ve come for. Did I mention the word ‘museum’? Read on . . . 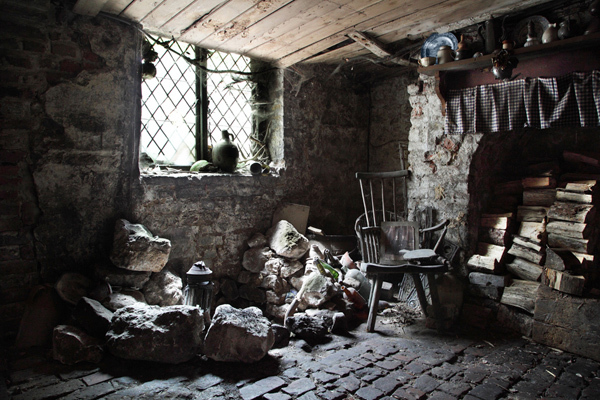 This house is an art installation created by American artist, Dennis Severs (1948-1999), who was interested from any early age in recovering the past, particularly eighteenth-century Anglo-Saxon life. When he was 17 he could no longer resist the magnetic attraction of London and in 1979 Severs bought the five-storey Georgian house at 18 Folgate Street, Spitalfields, for his home. He slept in each of the ten rooms so that “I could arouse my intuition in the quest for each room’s soul”; he lived as he imagined its original inhabitants might have done in the eighteenth century; he scoured old shops and street markets to seek out antiques, costumes and bric-a-brac to furnish and ornament each room. This eccentric man existed in a Miss Haversham-esque state withdrawn from the twentieth century. 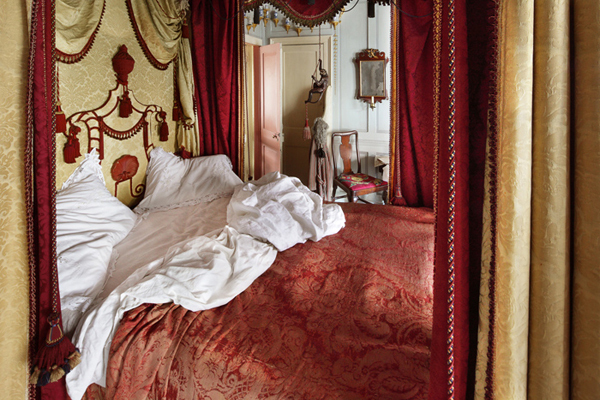 Now, twenty-first-century visitors can experience these rooms as they might have been used between 1724 and 1919. Severs even created an imaginary family of wealthy Huguenot silk weavers who emigrated from France in the early eighteenth century: the Jervis family members occupy the rooms but are always out of sight, as if they had just popped out or moved to another room. I could have walked past this house as there is no sign outside, just a few tell-tale people waiting to be invited inside. Eventually, five visitors are ushered out by the curator from behind the heavy black door; he addresses us in a flat voice: “You are about to enter a living house, not a museum. The Jervis family members are present but they may have left the room or the house as you enter. No photographs; and go through the house in complete silence. Smell the smells and listen to the sounds.” It was suggested we start downstairs and make our way up through the time frame: I didn’t dare refuse. Inside at last—I drew in a deep, and silent, breath as my senses engaged with the past. Down creaky stairs into the smoky and dark remains of an old hospice and leper hospital (founded in 1197) below ground level; next to it was a kitchen with open fire and items that could have been retrieved from a Victorian scullery. Half-peeled lemons and pieces of freshly cut vegetables are scattered across the old wooden table; a tattered recipe book was covered with dust (or was it flour?). It looks like a still-life painting, but Severs would probably scold me for thinking such a thought; here, life is only still, not absent. I look up and a young boy from the present is looking down at me from the pavement above, beaming his charming smile into this place from the past. His mother points to me and encourages her son to wave at me. I wave back enthusiastically—I feel like I should be wearing a mop hat and sporting a missing tooth. He’s gone, and now I think of Jack the Ripper, who may have roamed this very street in the late nineteenth century. I imagine the hooves of black horses and carriage wheels pounding by across the roughly laid brick street. 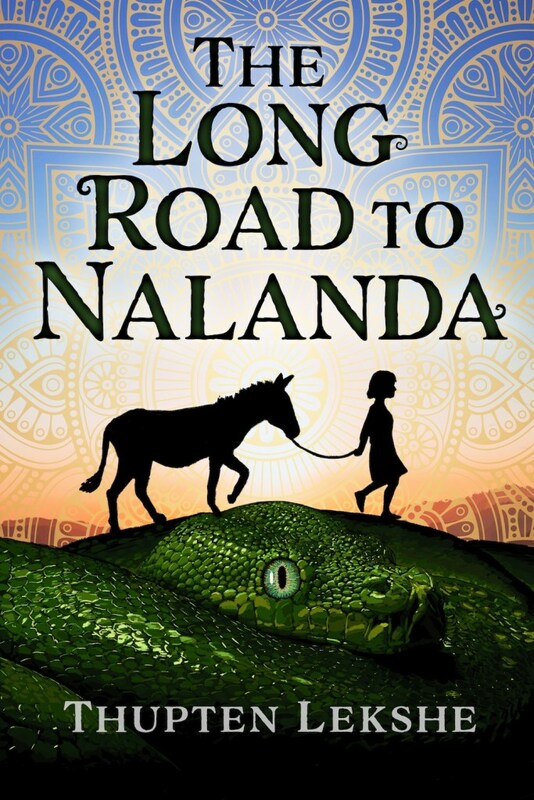 As I climb back up the narrow wooden stairs to the front dining room I hear the sound recording of a horse and carriage—chilling. I am getting the feeling that this place is not just a house with period furnishings, but a sublime collection of theatrical rooms. There are no didactic labels on the walls to explain the objects; instead, I read on pieces of old parchment: “Pay attention”, “You either see it, or you don’t”. This is what Severs demanded of visitors: to use the senses when investigating the past. Items are not behind glass, but arranged in a domestic context with the smells, recorded sounds and ambience to complement them. I enter. The theatre continues: a ‘real-life’ drama has just happened seconds before I opened the door. 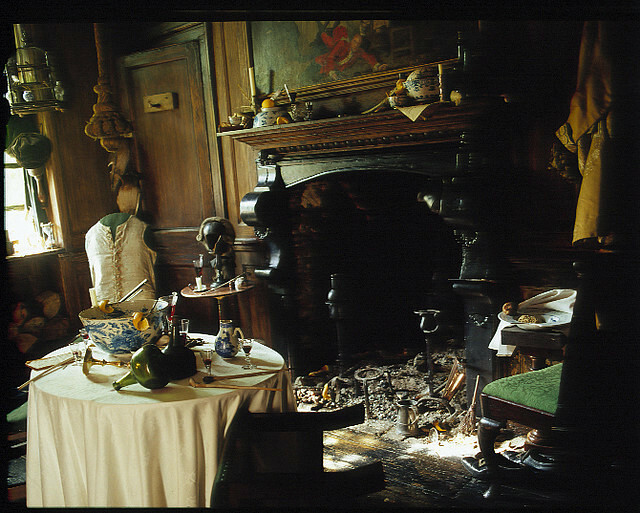 The Hogarth painting above the mantelpiece narrates the arrangement of the room: an overturned chair, a half-eaten apricot, scattered raspberries, a punchbowl with a curly piece of lemon peel hanging over the edge and a candlestick that has been knocked over, the wax puddled onto the tablecloth. The sweet fragrance of sherry or dessert wine wafts out of the half empty glasses on the table and the air smells of stale tobacco and wood smoke. Pieces of broken clay pipe are lying on the floor, the same three pipes depicted in the painting. The bedroom, with its profusion of Chinese blue pottery hanging on the wall (a Victorian obsession) and the glorious unmade bed, is my favourite room so far. Clothes lay where they were discarded; there are letters supposedly just written by Mrs Jervis on yellowing paper, yet we know it is a modern hand, placed next to pearls and a few morsels of food fresh from the market. It is becoming increasingly apparent that there is confusion between the animate and the inanimate, and between still-life and the evocation of a moving ‘landscape’. I felt like a protagonist walking in a labyrinth inhabited by ghosts. Walking up the final set of stairs to the top floor and discovering the Dickensian attic, the finery of cloth and furniture transforms into objects and clothing reserved for the poor. Tatty clothes made of the dullest calico hang above my head on the stairwell and inside the attic. Here, time makes way for the mid to late nineteenth century. The actual time is the death of William IV in 1837—we hear bells and gunshot salutes heralding Victoria’s accession to the throne. I imagine that these squalid living arrangements were reserved for poverty-stricken renters caught in the grip of urban hardship caused by the industrial revolution. A high stool and dusty writing table are set into a corner, which could have been a stage prop for Tiny Tim’s counting table. Severs has given this house a narrative and brought it back to life; but it is a house in decay—all is smell, shadow and decomposition. However, this place of art is so hypnotic that I’ve made a mental note to come back at Christmas, sometime in the future. It would be an evening experience with flickering candles and the sweet smell of fruit mince soaking in brandy, shortbreads just out of the oven and steaming, fragrant mulled wine. I would feel the presence of Dickens and know how he would have approved of the Jervis family gathered around the glowing hearth, enjoying each other’s company, safe from the streets that bred another type of human being. In this house – a visitor without imagination can be dangerous . . . 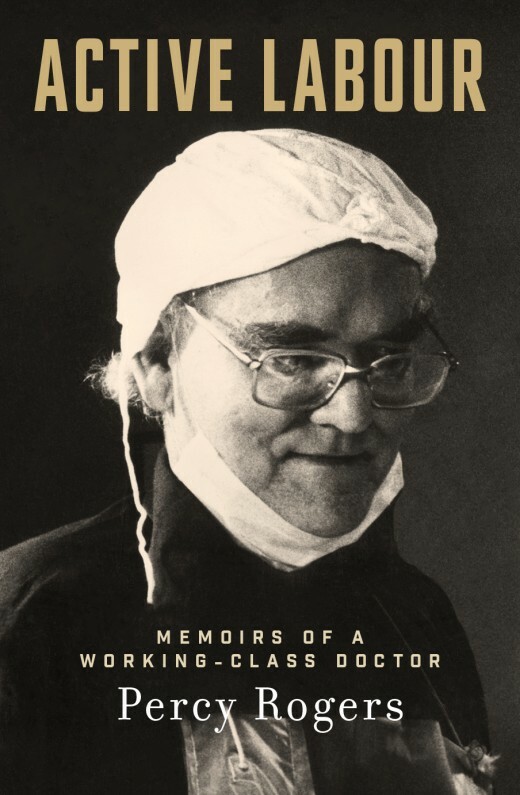 However, more dangerous are those with unstructured imaginations who will employ fancy to imagine absolutely anything, and often make themselves the centre. . . . what we imagine here should be just right; we can have a little fun. This East London house has a bewildering narrative that is deliberate and could easily be labelled ‘weird’ if it were not for the potency of Severs’ artistic vision. One of his cryptic handwritten notes on old parchment tossed on a table summed up my experience of 18 Folgate Street: “This house is not what you see, but what you have only missed and are being asked to imagine”. 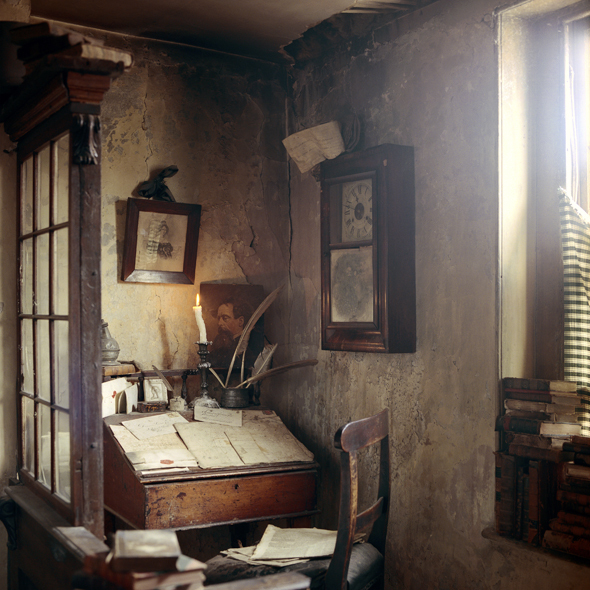 Dennis Severs’ House is an escapist and nostalgic trip back in time; sometimes perverse, sometimes uncanny, as fake as performance, generally spooky, a blur of the past and present, art and life—but, simply, one that was worth the trip to Spitalfields. If you’ve ever been drawn to step into a painting and participate in the narrative, then this is the place to experience it for real. 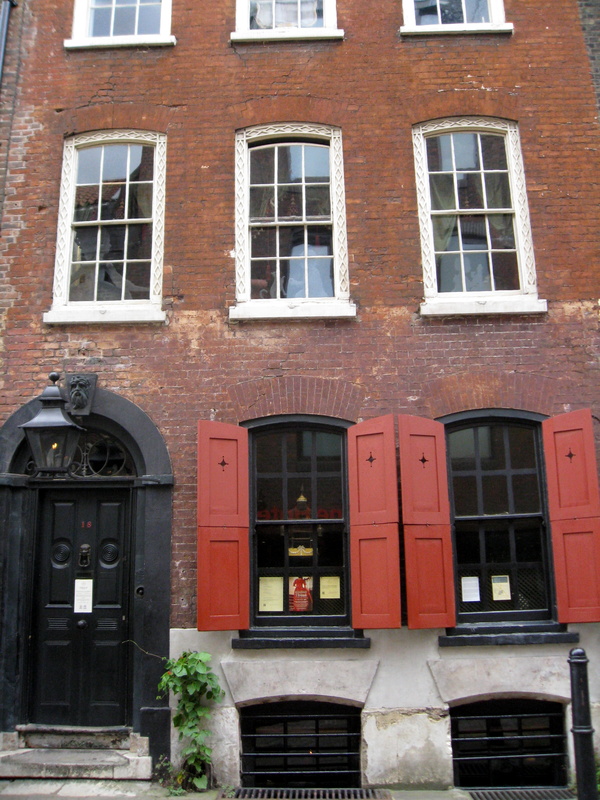 Just before his death, Dennis Severs bequeathed his house to the Spitalfields Historic Trust, a charity dedicated to Georgian houses. Thankfully his house not only continues to survive as an idiosyncratic attraction, but it is more popular than ever. 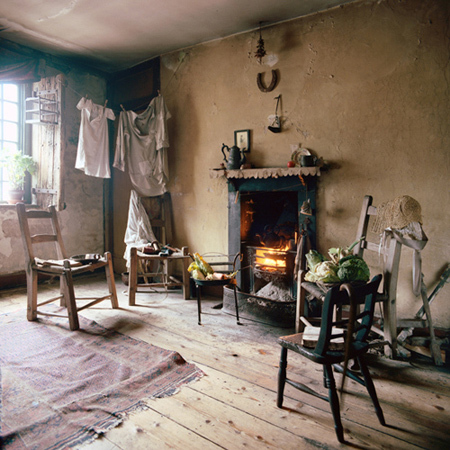 Dennis Severs, 18 Folgate Street: The Tale of a House in Spitalfields. You will definitely enjoy this house, Barrie. You’re right. Spitalfields derives its name from the leper hospice, St Mary’s Spital, and the fields on which it stood in medieval times. What a fascinating thing it is! Not only to view a house as a living being but to create it as such. Is this the ultimate installation?